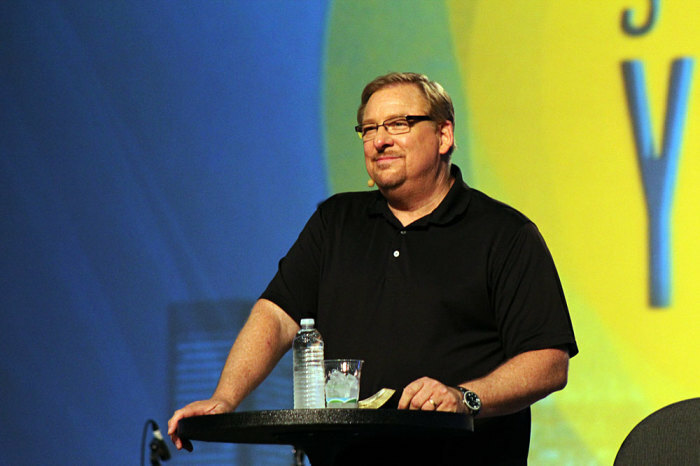 Pastor Rick Warren of Saddleback Church in California spoke about the "absolute worst day" of his life when his son, Matthew, died by suicide on April 5, 2013, and emphasized that without the hope of Jesus Christ, he and his wife, Kay, would have never made it through. "No one needs to suffer by themselves," Warren said in a video promoting World Mental Health Day on Monday. "In 2013 my son Matthew lost his battle for hope, and he ended his life after 27 years. The day he died was the absolute worst day of my life. Many people since then have asked me, how did you and Kay get through those darkest days? The answer is real simple. The hope that we have in Jesus Christ," he explained. The pastor continued: "Without that hope, we would have never made it. It was our hope in Christ; it was the hope that we received from our family, from our church, from our small group, from our friends." In an interview with The Christian Post last year, Kay Warren said: "I have a certain hope that God will make all things right and He will rebuild the ruins of our lives. I'm absolutely certain that I will join Matthew in Heaven because Jesus is alive. I'm gonna live. Those are things that are absolutely certain. I don't have any doubt over them. And so my hope is stronger than it ever has been." World Mental Health Day is marked on Oct. 10 every year, according to the World Health Organization, and seeks to raise awareness of mental health issues around the world through mobilizing efforts for support. The Warrens have become outspoken advocates on mental health issues since their son's death, and have said it is important to fight the stigma attached to people with mental health disorders. "The problem [with Matthew was], if your mind doesn't work, it doesn't work," Warren said in an interview on "The View" in May 2014. "We're trying to remove the stigma with [mental illness]." "If my heart isn't working, and I take a pill, nobody thinks anything of it. [Same with the liver]. But if my brain doesn't work right and I take a pill, I'm supposed to be ashamed of that? What's wrong with that?" he asked. They have also hosted conferences, such as the Gathering on Mental Health and the Church, calling on people in the faith community to start talking about such issues. "Churches are typically the first organization families in pain reach out to," Warren said in October 2015. "When a family is having a mental-health crisis, they don't go first to their lawyer. They don't go to their accountant. They don't even go to the police or the doctor or even the principal. Usually, the first person they call is the church." In the latest video, the pastor said that people were not made to go through the worst times of life alone. "We were made for hope. The Bible calls hope the 'anchor of your soul,'" he said. He spoke directly to viewers and urged them to spread the word as far as they can, and encourage people to visit the free online event at Hope4MentalHealth.com, which on Monday is set to offer "healing, information, comfort" to anyone in pain.